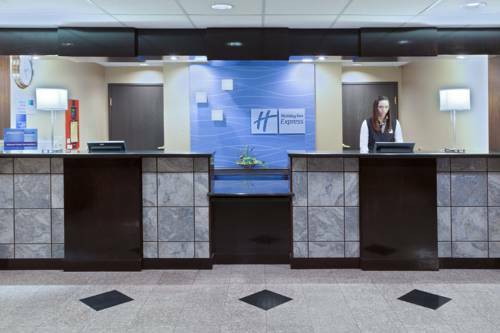 Beautiful Scenery Enhances Ashtabula Hotel's LocationWhen business brings you to Ashtabula, set up your office at the Holiday Inn Express Hotel & Suites Ashtabula - Geneva. The hotel's guests benefit from a fantastic location near area corporations and attractions to fill their downtime, as well as being halfway between Erie and Cleveland.Many businesses call the Ashtabula, Ohio area home. The hotel's corporate guests enjoy proximity to companies like Millennium Inorganic Chemicals, Molded Fiber Glass, General Aluminum, Norfolk Southern and King Luminaire. The hotel is set just off of I-90, making it easy to commute to other nearby business destinations. Cleveland is less than an hour from this property, too.There are also plenty of things to do during your stay in Ashtabula, Ohio. The hotel's facility is just 10 minutes from the Lake Erie coast, where Geneva on the Lake offers plenty of outdoor activities. The local climate provides the perfect setting for excellent wineries, which guests can visit for tours, dining and tastings. Nearby, the Spire Sports Complex can be used for local sporting events of all kinds and can be reserved for tournaments and banquets.The Holiday Inn Express Ashtabula features amenities to make your stay more convenient, such as 24-hour Business and Fitness Centers. The indoor, heated pool will help the hotel's guests relax. Visit Ashtabula, Ohio and experience the majestic local scenery. Local Italian eatery offering Dine In, Carry Out, and Delivery to your room! Local award winning winery offering tours, a full service restaurant, and a live entertainment outdoor terrace. Geneva On The Lake is the local "Strip", where you can sing karoke, ride go-karts at Adventure Zone, and stop for hot dogs and ice cream at the famous "Eddie's Grille" all while being on the shores of beautiful Lake Erie. All U.S. Presidents have space here, especially those not recognized by other presidential museums. Nick Pahys Jr.reveals the shocking truth: George Washington was not the first President of the United States.